Air Festival has announced that it is moving islands to a new home at La Brisa in the south-west of Bali. 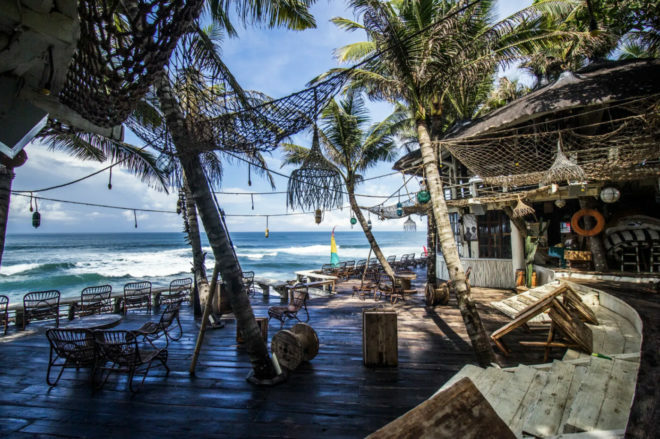 La Brisa sits on Echo Beach, which is just outside of the hip and alternative area of Cangu and is home to some breathtaking décor, sustainably sourced food and genuine Balinese hospitality. La Brisa is built entirely of reclaimed wood from 500 old fishing boats and is one of the few sustainable eco-friendly venues in the island that radiates true Balinese character. Air Festival founder Sylvie Forêt said of the move: "We are really excited for the Bali Edition of the Air Festival. The move to Bali not only makes it more accessible, but the new location is a pretty gorgeous setting. It’s not Gili Air, but it’s got another kind of energy that’s equally powerful. Set on a beach within a sustainable venue pushing for the same high standards we are." The reason for the change is that Air Festival's home base is getting a makeover. "Recently, we learned that Air Festival’s home on Gili Air will be undergoing extensive renovations throughout 2018," the organizers said. "Beginning in March, local authorities are scheduled to demolish numerous ocean front buildings that have surpassed the legal high tide building mark. For us, this means that our beautiful dancefloor under the stars will most likely be clogged by rubble, and that our beach will be inaccessible due to the mess." Music will still span two stages – the main Air Stage and Awan Stage, which is the festival’s living, sacred fire-breathing heart that was just introduced last year. The line-up remains untouched and runs gamut from house to soul and everything in between. Fans of deep, spine-tingling house music will love the fact New York’s Fred P from Soul People Music is playing, while Tuskagee and Crosstown Rebels artist Bas Ibellini will bring plenty of fresh tech house. More dubbed out house will come from Sushitech’s Dutch star Makam, Rampa deals in warm, progressive and melodic house with his releases on labels like Innervisions and Kelinemusik and loopy tech house man Boris Werner will keep you dancing for days. Sweden’s Art Alfie put out a fantastically cuddly album of charming house on Studio Barnhus recently so expect more of the same from him. Ata, DJ and founder of renowned club Robert Johnson whose labels include Playhouse, Klang, Ongaku also billed to play. Even more will be covered from Mimi Love, KMLN, Peak & Swift, Jonathan Kusuma, Esther Silex, Dave Dinger, Walker Barnard, Tiago Oudman, Sylvie Forêt, Dr. Kessler, Ricardo Who, Archie, Trigan Young, Dr. Yez, Kai, Kusaki and more. Air Festival runs from March 30th until April 1st and tickets can already be purchased here for $120.